The swatch is the superhero of knitting, it can save you from great dangers and has the ability to foresee the future. We asked a few friends to tell us about their love for the swatch and how it can change a knitter’s life. Today, in this third post on the subject, Andrea Rangel continues to share with us! We asked a few friends to tell us about their love for the swatch and how it can change a knitter’s life. Today, in this third post on the subject, Andrea Rangel continues to share with us! When swatching for design, I tend to do a lot more than I do for the Swatch Project. 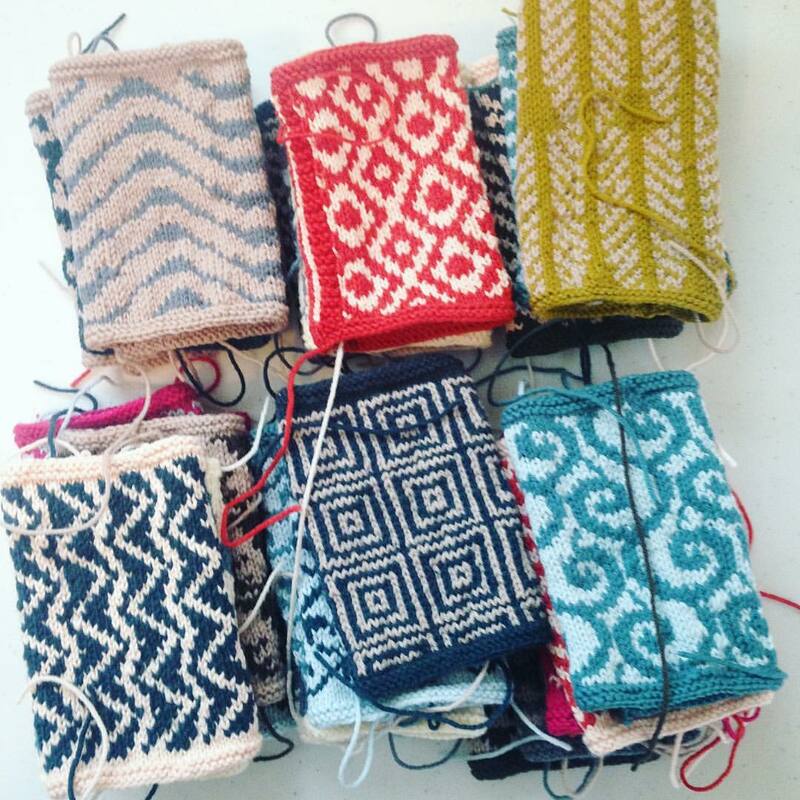 I make a bunch of six-inch squares with different needle sizes to see the fabric at different levels of firmness, and in several different stitch patterns so I can lay them side-by-side to decide which one will be best for the project. I don’t try to achieve a particular gauge, but find a fabric I like and then design at this gauge. Even if you aren’t designing, I encourage you to try your yarn at a few different gauges (using different needle sizes). Decide which fabric you like best, and then find a pattern that matches your gauge, rather than trying to force your yarn to match the pattern. Pro tip: you can search Ravelry’s pattern database using gauge as a filter. 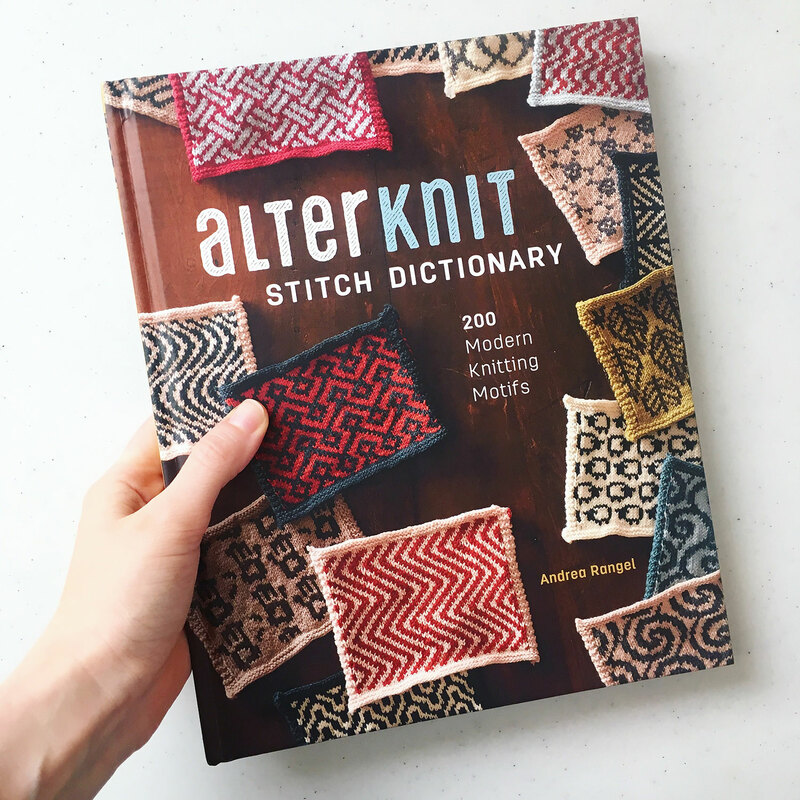 I can’t write about swatching without mentioning my new book, AlterKnit Stitch Dictionary. I made over two hundred swatches for the book, all in stranded colorwork. My husband Sean designed all of the motifs, but they also needed to be knitted so readers could see what the finished fabric looks like, and so that we could be sure the chart would work well when actually knit up. If you want to play with colorwork or steeking, but need some practice, I encourage you to just make swatches of some of the motifs in the book! Then if you want to try cutting your knitting, you can practice reinforcing and cutting on your swatch so you can experience firsthand how thrilling and empowering it is. If you make things from AlterKnit, please tag your photos with #alterknitstitchdictionary so I get to see them! I’ll change my mind after swatching, and pick a different yarn. It’s okay if a yarn you planned for a project just isn’t quite right when you swatch it. It happens and you can use that yarn for something else. Swatching is such a fun part of knitting. It can make your knitting life richer and more satisfying. Happy swatching! To follow Andrea wooly adventures find her on Facebook, Instagram, Twitter & Ravelry.